WESTERN Australia has harvested around two-thirds of its winter crop now that receivals have hit 10.13 million tonnes (Mt), according to the latest weekly report from the state’s bulk handler, CBH Group. The company said grain was being moved to port for its summer shipping program now under way, with a potential record of more than 2Mt of grain valued in excess of $300 million set to be shipped this month and in the first half of January. CBH Groups said the trade has been looking to cover these positions in barley and wheat, as the late harvest has seen growers selling later than usual. In barley, the spread between malting and feed has continued to narrow, with malting barley only an $8-10/t in front, and second-grade malting now trading at parity to feed. Malting has continued to make up around 35 per cent of barley receivals, in line with previous seasons. Demand for malting has been soft, and has been reflected in its lower-than-normal premium over feed. As a whole, demand for barley has been lumpy, with some of the trade paying a slight premium to cover existing business to be shipped in late December or early January. Feed barley values are at levels close to where the trade expects Saudi Arabia to buy in its next tender, which is not expected for some weeks. As the barley harvest begins to slow, CBH Group said it thought growers would hold some of their malting stocks, looking for higher values later in the year. In the wheat market, last week saw a continuation of lower-protein deliveries, with the trade lifting the premium for Hard wheat. Australian Hard 1 has been trading at close to $400/t free in store (FIS), $45/t over APW1, and well its traditional premium to APW of $10-25/t. Additionally, the spread to ASW has continued to increase, and was last week $20-25/t below APW, which last week was trading at around $350/t FIS. Russia’s difficulties in obtaining phytosanitary certificates at some ports has seen some export demand switch to Australia for prompt positions. However, the shipping stem for December and a large part of January is fully booked across Western Australia, and has left little room for additional volume. CBH Group said grower contracting continued to be relatively consistent over last week, as growers start to look at options for lower-protein wheat. In the canola market, pricing remained at around $570/t last week, with the trade looking to cover interest from European crushers. Prompt positions appear to have been filled, and Europe is looking for positions in the deferred months, which should ensure grower pricing remains close to existing levels. Last week saw the busiest of the harvest to date for receivals, with many sites breaking daily receival records. Despite afternoon weather interruptions in the Central Wheatbelt, CBH sites took a record one-day receival of 525,035t on 3 December, surpassing the previous record set in 2014 by more than 15,000t. “Things have finally started to pick up in the Esperance and Albany zones, with both receiving more than 600,000t this week,” general manager operations David Capper said. The Albany zone had a big week, receiving 621,000t to take its season total to 1.25Mt, still well behind the 1.7Mt received at this time last year. Barley has continued to be the dominant grain received in the Albany zone, and has accounted for two-thirds of all receivals, with the balance to date made up of nearly equal parts canola and wheat. “Rain received over the southern and western parts of the zone this week will slow receivals for a few days, and we expect that wheat deliveries will ramp up again over the next week,” Albany zone manager Greg Thornton said. The Esperance zone has also had a good week of deliveries, with 603,000t being received in the week to 6 December. CBH said all growers in all parts of the zone were now fully into harvest, and wheat was making up most of the tonnes being received. 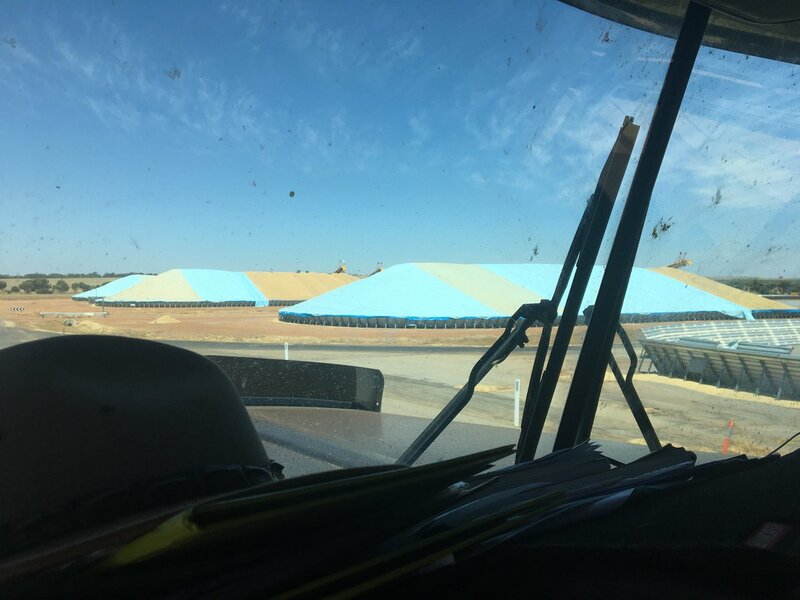 “Daily receival records were broken at both Beaumont and Munglinup this week, which I think highlights the good harvest conditions we have had recently, and in the case of Beaumont, the value of improved throughput at the site,” Esperance zone manager Mick Daw said. Geraldton zone exceeded its harvest estimate in the past week, and with most of the zone still harvesting, the network is functioning at full capacity. Most growers were now into harvesting wheat, with barley and canola almost complete, and lupins deliveries steady. “We are coming under extreme pressure at some sites for storage capacity, with some services having to close off, but we are managing as best we can with our rail and road transport resources,” Geraldton zone manager Duncan Gray said. Delivereies in the Kwinana zone were 100,000t shy of 5Mt on 6 December, and barley and canola deliveries have wound down, and most growers have moved on to harvesting wheat, with its yields better than expected. Severe weather across the north and east of the zone earlier in the week slowed deliveries down for a few days. “There were some isolated spot fires caused by lightning around the Goomalling area, and large hail near Tammin unfortunately caused some crop damage to a few growers, but it appears the damage was not widespread and will hopefully have no or minimal impact on crop quality,” Kwinana assistant zone manager Allan Walker said. So far, the Kwinana zone has broken daily receival records at 14 sites this harvest.